Map courtesy of The Oscars. The 91st Annual Academy Awards will take place at the Dolby Theatre in Hollywood this Sunday and Metro buses are beginning detour schedules as preparations get underway for the show. Metro Bus Lines 212, 217, 222 and 780 will be on detour routes in the Hollywood area through 6 a.m. Tuesday, Feb. 26, or until barricades are removed by the city of Los Angeles. For route and stop details, please check the Service Advisories page. The Metro Red Line will run regular Sunday schedule on Feb 24; however, trains will bypass Hollywood/Highland Station the entire day. There will be no public access to the station. You can use Hollywood/Vine Station as an alternate and transfer to bus or walk. Red Line trains will resume service to Hollywood/Highland Station with the start of service on Monday, Feb 25. More buses are expected to detour leading up to Oscar Sunday; please visit the Service Advisories page for specific route information. 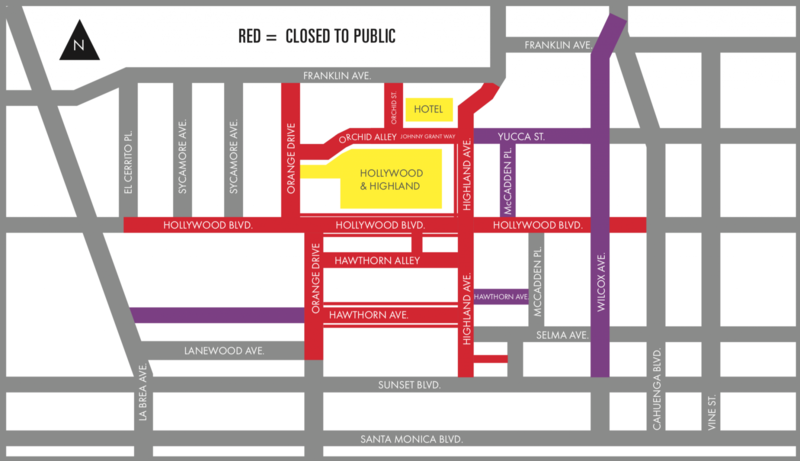 For more information in general on the street closures leading up to The Oscars, check their closures page. For real-time unscheduled service alerts, follow us on Twitter @metrolaalerts. Why are line 217 buses continuing north on Vine to Yucca, then right Yucca, right Argyle, left Hollywood and regular route when they could make a right on Hollywood to Argyle and regular route? Argyle is one block east of Vine and buses have made a right off of Vine for many years including Lines 180 & 181 currently. It not only is out of the way but a hazard with additional right and left turns. On the map, what does the PURPLE code denote? It appears to be for day of closures with exceptions for local residents and emergency vehicles. The map is provided by The Oscars, details are on their page here. Fixed it! The link is the same, it doesn’t seem like they updated the URL.